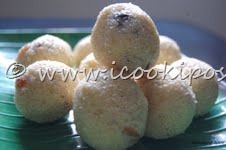 Actually I was thinking of making some Indian sweet for my Malaysian neighbor to give for Diwali. Then the idea of making rava ladoo came to my mind. It took only 30 mins to prepare and it came out very well. Heat 3 tbsp of ghee in a pan.Roast rava for a few minutes till you get a nice aroma of roasted rava.Allow it to cool. Fry cashews and raisins in ghee and keep aside. Once rava is cool , Blend together sugar and rava to get a powdered mix. Add roasted raisins and Cashewnuts to it. Add milk little by little and keep mixing for few minutes. Take small amount of the mix and roll into balls. You can keep in the fridge for crispy ladoos.